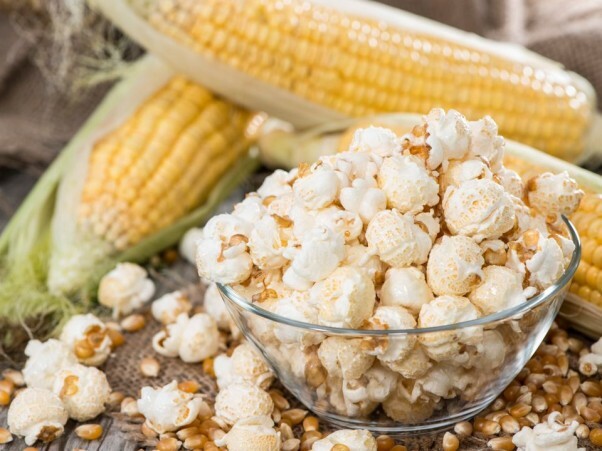 First, the sound hits you — “pop, pop, pop” — slow at first, then a firestorm of kernels as they magically transform into billows of crunchy white deliciousness. Next the smell wafts throughout the room, tantalizing your nose and your taste buds. By the time your teeth crunch down on that first bite, you’re completely hooked. Popcorn is an irresistible treat. Try keeping a bowl to yourself during family movie night, or buying a small bucket at the movie theater. Before you know it, everyone is grabbing a handful. 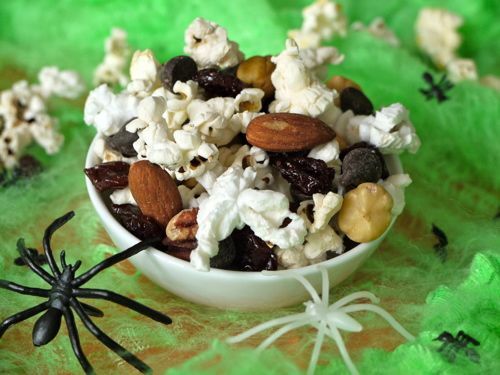 Popcorn is a simple, tasty treat on its own, but it also lends itself to a variety of toppings; butter, sugar, cinnamon, caramel, a sprinkle of smoked paprika, even chocolate! 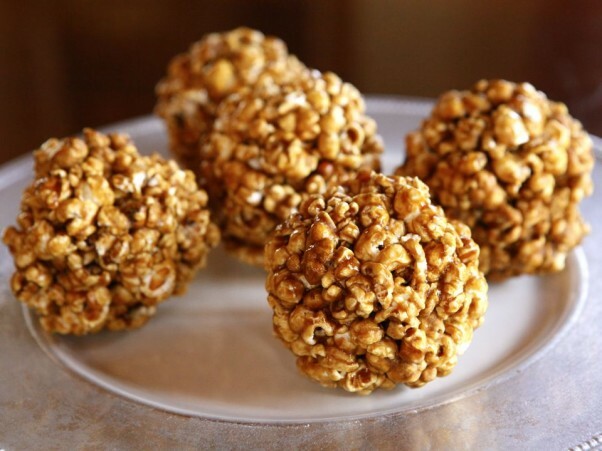 Popcorn provides a perfect canvas for your sweet and salty cravings. So what makes popcorn “pop”? The secret is in the kernel. Popcorn comes from a certain variety of maize that produces small kernels with a hard outer shell. These kernels cannot be chewed without a good chance of cracking your tooth. To get to the fluffy edible part, you must heat the kernel, which turns the moisture within into steam. When the outer shell has reached its pressure point it bursts, releasing the soft inner flake and creating what we recognize as popcorn. 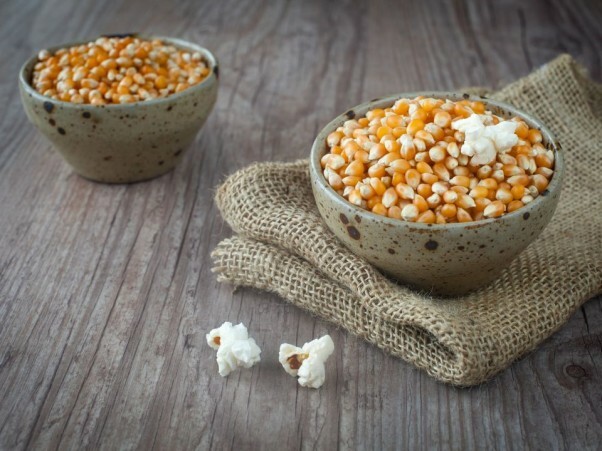 One of the earliest recipes for popping corn came from Daniel Browne during the 1840s. His method required one to “Take a grill, a half pint, or more of Valparaiso or Pop Corn, and put in a frying-pan, slightly buttered, or rubbed with lard. Hold the pan over a fire so as constantly to stir or shake the corn within, and in a few minutes each kernel will pop, or turn inside out.” He adds that salt or sugar can be added while the popcorn is still hot. 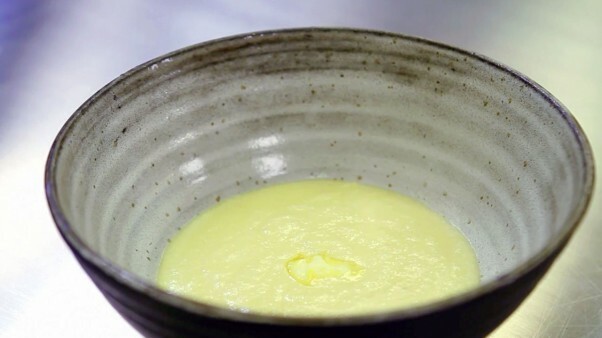 The problem with this method was that butter tended to burn before reaching a high enough temperature and lard produced popcorn that was soaked with grease. It wasn’t until the second half of the nineteenth century that an efficient method for popping corn was developed. These newly invented “poppers” were made from boxes of tight wire gauze attached to a long handle; they were meant to be held over an open flame. Poppers offered several benefits, including the ability to contain the popped kernels while also keeping hands away from an exposed flame. Over the years, many improvements were made to the original popper prototype, which made the snack even more accessible to the masses. Popcorn’s mass appeal was brought to new heights thanks to movie theaters. Surprisingly, theater owners were not on board with popcorn sales in the beginning. They thought it might create an unnecessary nuisance in addition to requiring expensive changes, like installing outside vents to rid the building of smoky popcorn odors. 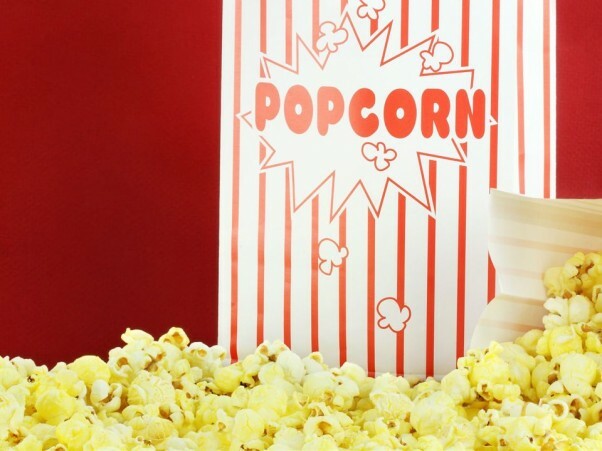 Hawkers, seeing the potential in popcorn sales, took matters into their own hands and began selling popcorn and Cracker Jack while walking up and down the theater aisles. The Depression eventually changed the minds of theater owners, and they began to view it as a small luxury that patrons could afford. Unlike most treats, popcorn sales actually rose during the Depression. Instead of installing indoor concession areas, theaters charged outside vendors a dollar a day to sell popcorn from outdoor stands. In 1938 Glen W. Dickson, the owner of several theaters throughout the Midwest, began installing popcorn machines in the lobbies of his theaters. The construction changes were costly, but he recovered his investment quickly and his profits skyrocketed. The trend spread quickly. Can you imagine walking into a movie theater today without the scent of popcorn welcoming you inside? I sure can’t. Recently the GMO debate has gained steam here in the U.S., particularly when it comes to corn. The majority of corn grown in the United States is genetically modified. 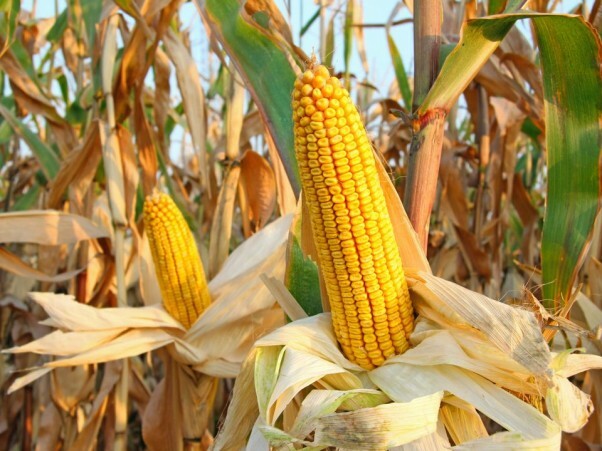 According to Jeffrey Smith, a GMO expert, the popcorn variety of corn has not yet been genetically modified. This means there is no genetically modified popcorn currently available on the market. Interesting that after all of these years, we’re still enjoying popcorn grown from the same seeds our ancestors used. 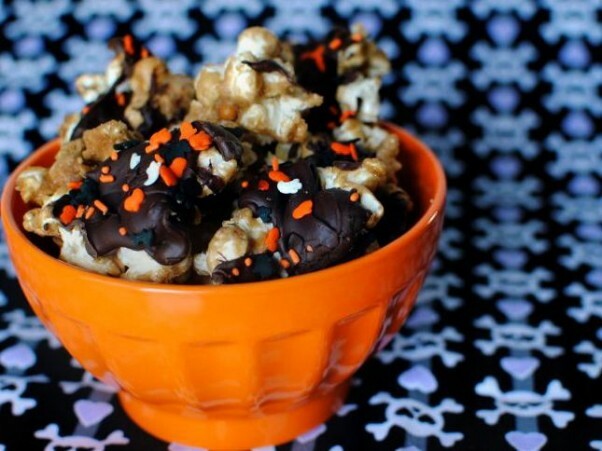 Here are some tasty and seasonal popcorn recipe ideas from around the web! Gossett, Margaret (1944). Children’s Picture Cook Book. William R. Scott, Inc., New York. McQueeny, Steve (1939). 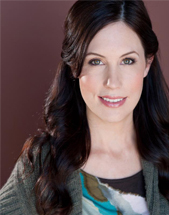 “How the Glen W. Dickson Theater Circuit Found New Profits in Lobby Shops.” Better Theater, 4 Mar. 1939. Print. Smith, Andrew F. (1999) Popped Culture: A Social History of Popcorn in America. University of South Carolina. Columbia, SC. Smith, Jeffrey M. (2007). The Campaign for Healthier Eating in America. Institute for Responsible Technology. 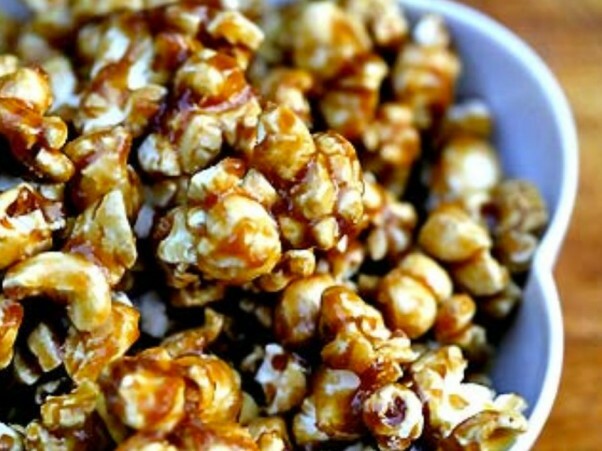 Make a bowl of salted caramel popcorn for a snack. The quality is worth the extra effort over the microwavable version. These deliciously tender pancakes are perfectly fluffy with the flavor of buttered popcorn. 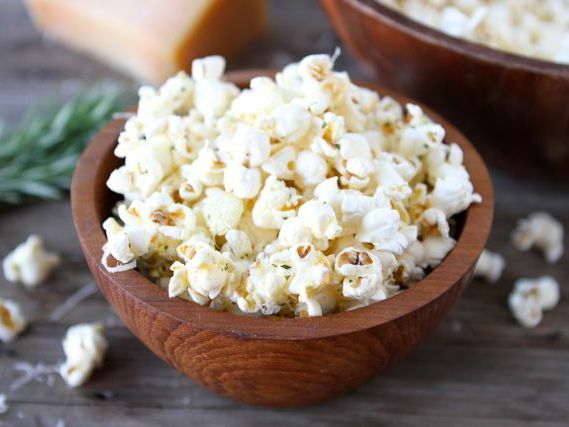 Top with extra popcorn for a crunchy texture.